Controller type, it is either Dominant or NonDominant. If Track Position is checked, Simulate Position options will show. If Simulate Position is selected as When No Position or Force Simulation, Follow Head checkbox will show. Follow Head means that when controller is put (on table or whatever), controller should follow head movement or not in scene. Controller loader will load controller model from device service if this option is checked, otherwise controller loader will load controller model from SDK/package. 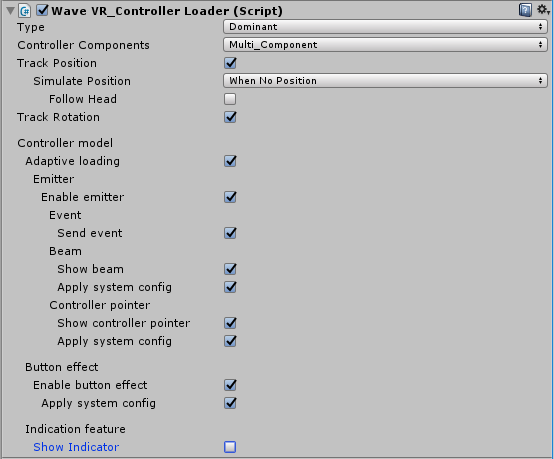 If developer checked this option, WaveVR_ControllerLoader will provide more options about button effect, beam, controller pointer and indication feature to you. default is true. Once Adaptive loading enabled, there are more options provided to developer. The loaded controller will be able to show beam, pointer and send button event. 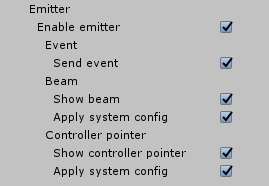 If Enable emitter is checked, developer is still able to decide if each of beam/pointer/event is active or not, If Enable emitter is not checked, all of beam/pointer/event are deactivated. If the loaded controller is able to send button event. If this option is checked, controller pointer is defined by system config. default is checked. The controller pointer will blink if checked. default is false. Minimum pointer, default is 0.01f. The controller pointer will use texture provided by WaveVR SDK. default is checked. If Use default pointer texture isn’t checked, developer will select Custom pointer texture. Developer is able to use it to design your pointer image. If this option is checked, button effect is show when key is pressed. default is checked. If this option is checked, button effect color is defined by system config. default is checked. If Apply system config isn’t checked, button effect color is defined by developer setting. Enable indicator feature, default value is false. Finally, controllerLoader will broadcast CONTROLLER_MODEL_LOADED event with device type and controller instance to all when the controller model loads successfully. Please monitor this event if you need to get the controller instance to proceed or customize. Moreover, controllerLoader will broadcast CONTROLLER_MODEL_UNLOADED event when controller is disconnected. Since there are so many options, we won’t demonstrate thoese photo by photo. 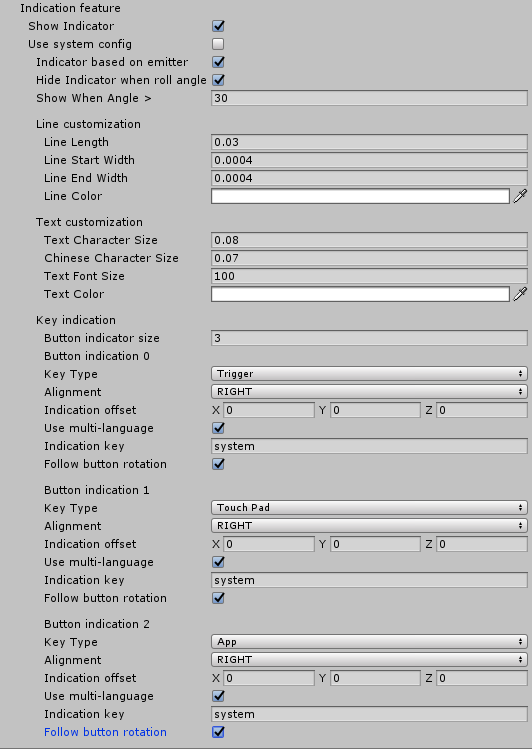 Drag the prefab ControllerLoader into your scene and rename to whatever you like. Select position and/or rotation tracking options. Already described above in Introduction part. Keep system setting for other options. Broadcast event is activated after WaveVR is initialized and only works on the device. If you want to know when a controller is loaded in play mode, implement WaveVR_ControllerLoader.onControllerModelLoaded delegate. See the example below. The go parameter is a controller instance generated by the controller loader.